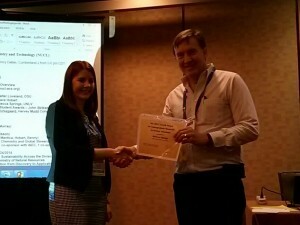 The 2013 Coryell Award winner, Rebecca Springs from University of Nevada, Las Vegas was recognized at the NUCL Business Meeting during the Spring ACS National Meeting in Dallas, TX. Rebecca did her undergraduate research project under the direction of Prof. Ralf Sudowe. Rebecca’s research project investigates the use of advanced radiochemical separations for the rapid analysis of processes samples from a nuclear recycling facility. The goal of the project is the development of separation techniques that can be used to analysis grab samples from nuclear recycling facilities in a quick and efficient manner. The rapid turnaround time of the destructive sample analysis will assist in establishing more reliable and faster methods for material accountancy and nuclear safeguards. Rebecca set out to evaluate the influence that other constituents (anions) present in the dissolved fuel with have on the separation of several actinide elements (Am, Cm, Pu) of interest using extraction chromatography. Knowledge of the degree to which potential interferences might affect the partitioning will allow the design of suitable methods for this complex sample matrix.